Auckland City FC midfielder Reid Drake is eager to continue his OFC Champions League form when the region’s premier club competition resumes with the quarter finals this weekend. 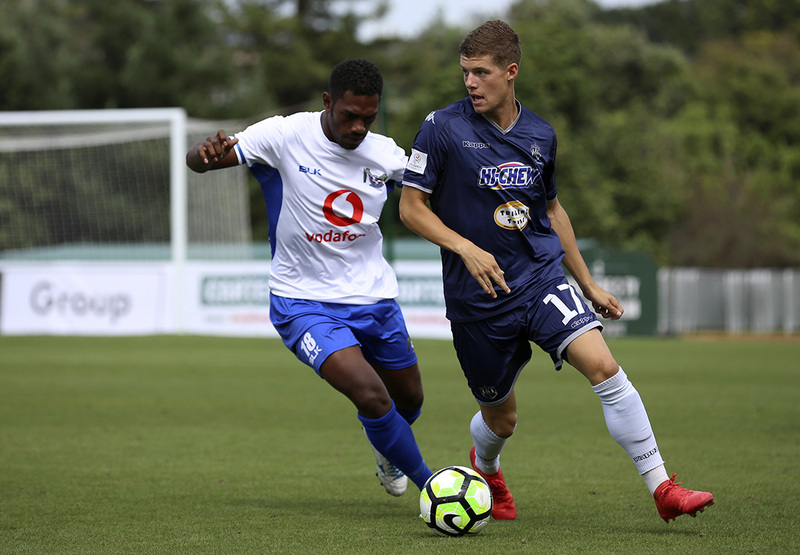 After watching from the bench as Auckland City FC regained the New Zealand title with a 1-0 win over Team Wellington in the ISPS Handa Premiership grand final on Sunday, Drake is eager to play a more active hand for the Navy Blues, just as he did in their group stage campaign. Waiting on the pine for the call to warm up has largely been Drake’s experience of the national league this season – just three of his 13 Premiership appearances have been starts – but he’s had a larger involvement in their continental campaign, playing all 270 minutes so far of their quest for a 10th confederation title. Tighter restrictions on the number of foreign players in the Champions League means Ramon Tribulietx will need to make at least two changes to his starting line-up from Sunday’s domestic finale and given his role in the campaign so far, Drake looks a good bet to be involved. The 22-year-old is comfortable with his role, as much as any ambitious footballer can be, but is itching to once again hear the opening whistle from the preferred side of the white lines. “As a footballer you always want to be playing in the starting eleven but it is a team game and whatever my role was in the national league it was more coming off the bench and that was fine, “Drake says. Into his third season with the club, Drake is at the older end of a group of young players Tribulietx has turned to this season in both competitions – Sunday’s match-winner Callum McCowatt has been a constant in Auckland sides this season and is just 19 – and Drake says the group have shown they can deliver the same high-standards fans have come to expect from the Navy Blues. “It’s just our job,” Drake says, “we turn up to training five nights a week and learn off the older players – the majority of which are ex-pros – and personally, after being there for three seasons, you do learn a lot from those players. Aside from his greater role in the OFC Champions League, Drake also played the full 90 minutes in a FIFA Club World Cup warm up against Al Ittihad Kalba SC in Dubai and last year featured in the club’s successful Lunar New Year Cup tournament in Hong Kong. He believes a successful OFC Champions League campaign could be a springboard for a greater role in all competitions next season but that it’s down to him to make the most of each and every opportunity. With new All Whites coach Fritz Schmid dipping into the national league to populate his first squad recently, Drake – who has yet to pull on the white shirt at any level – has even more motivation to force his way into the Auckland City starting eleven on a more regular basis. Drake and his Auckland City teammates claimed a new piece of history on Sunday with their seventh domestic title taking them past Christchurch United and Mt Wellington in the list of most New Zealand titles. It also extended their run of not conceding to 918 minutes in the national league (a New Zealand record) and to 1188 in all competitions since January 13. Going back to the group stage last year, Auckland have not conceded an OFC Champions League goal in 867 minutes a streak that Drake says that the side naturally wants to extend. Auckland City host Solomon Island champions Solomon Warriors at 2pm Sunday (local time) at Kiwitea Street in the quarter finals of the OFC Champions League.